As part of a series of coordinated strikes on the Mos Eisley spaceport, the Rebels learned that the Imperial communication's link was particularly exposed - if it could be knocked out, it would result in a serious setback in the Empires ability to impose Imperial Law on the Sector. 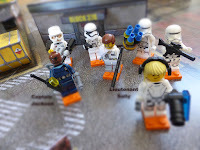 A small force of Resistance Soldiers had managed to disguise themselves as Imperial Storm Troopers and attempt to disable the link in the depths of the night. But little did the Resistance know that they had been betrayed: an Imperial Naval Unit, stationed at the Port, were alerted to the Rebel's plans, but not the details. 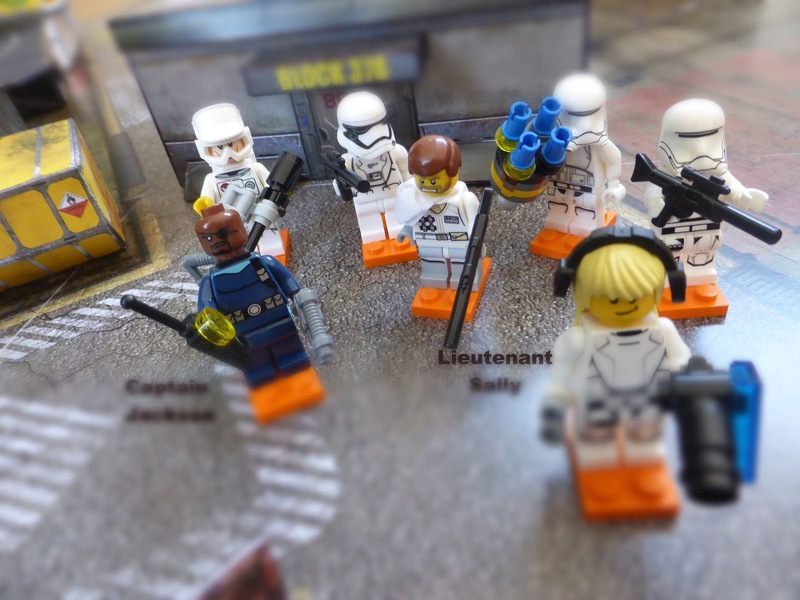 As such a covert patrol was dispatched with the intent of catching the Rebel's in the act and grinding their efforts into the sands of Tatooine. the four Objectives can be seen. Our map and terrain was rather lovely: using various paper craft sourced across the interweb we had everything from a landing pad complete with spacecraft, IKUBEs, various cargo crates, two buildings and more, all with a nice roadway down the center. 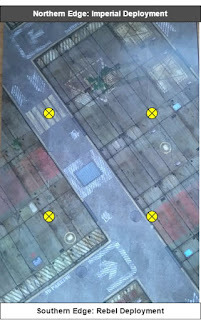 Four Objective Markers were placed around the middle of the map: one on the roadway, one on each of the buildings and one on the landing pad. 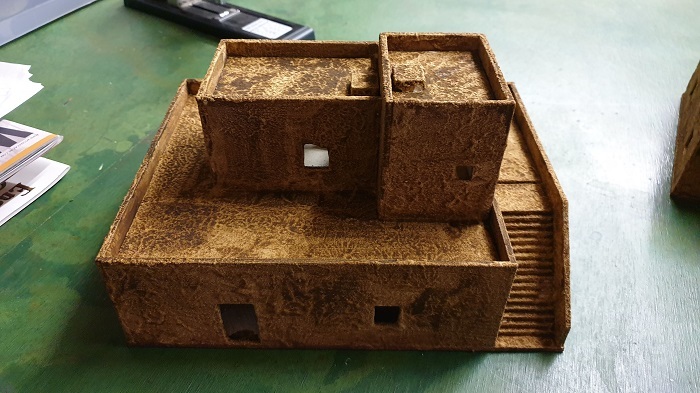 We employed our house rules regarding: (1) Reeling and Retreating (That Smarts) - making it harder for a Unit to be outright killed - , (2) only played strict terrain cover (i.e. didn't auto apply for Long+ Range shots) and (3) used Murphy's Law. We also stuck with (4) Impulse Actions and resolved Close Combat using (5) Opposed Rolls, (6) Ganging Up/Get Him and (7) Charging. Also the Sayonara Baby! variant on the TGTMG Hasta La Visata, Baby! rule seems to be working nicely. Whilst the above rules seem to be enhancing our games as of late, they aren't necessary for this particular scenario. They do however make for of fun (especially given how many 1's we were rolling... I'll have to get our dice checked). 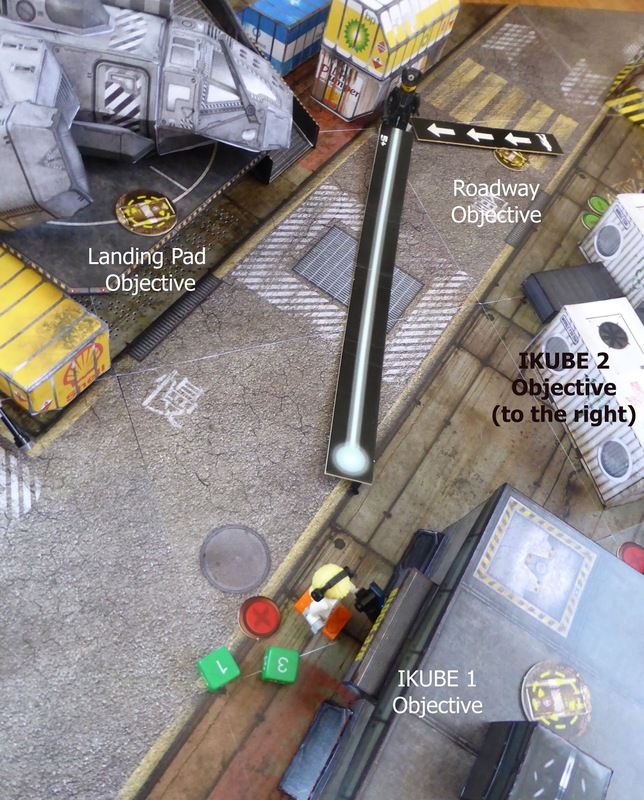 Regarding the terrain: the IKUBEs and Containers were all considered Level 2 and could be easily climbed (requiring a successful skill roll D6 fails on a 1). 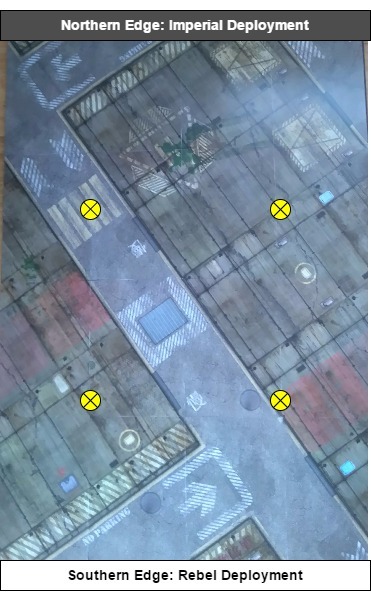 The two buildings were also Level 2, could be climbed and entered (requiring a forced entry skill roll D6 fails on a 1 or 2). Once inside they provided Hard Cover and we assumed they had adequate windows etc to allow firing. The Landing Pad was Level 2 high and had a bit of a tunnel between it and its adjoining Ramp. Finally, the Chickenhawk provided a (lovely) terrain item (Level 2, could not be climbed nor entered), that did no more than add to the mood. 1 x Heavy Weapon Soldier (D6,/4+/D8, Mini Gun and Combat Knife). The Rebels enter from the Southern edge, the Imperials from the North. The Rebels are allowed no Reserves. The Imperials must only deploy 3 units initially (Imperial player's choice), from the Northern edge. The remaining 4 units are treated as reserves which are in transit from nearby areas - see Tactical Advantage below for how the Imperial Reserves are deployed. The Rebels need time and access to the communication link. To do so they need to score 7 Objective Points. Objective Points are scored for each Impulse a Rebel unit spends idle within Point Blank of one of the four Objectives. For example, if two Soldiers remained idle next to an Objective, then 2 Objective Points are scored. Upon the Turn in which the 7th Objective Point is scored concluding, the Game is ended and the Rebels are awarded victory. Objective Points are not scored if there is a Reeling Rebel Unit or an Imperial Unit (Reeling or otherwise) within Point Blank of the Objective. The Imperials need to stop the Rebels from scoring the 7 Objective Points, either by routing the Rebels or by the game ending. Tactical Advantage is rolled as per usual. For example, 3 Marines in reserve, roll D4, get a 4 means no Marines enter the fray. A roll of 2 means 2 join the battle and are deployed and activated. The Rebels entered from the Southern Edge: Captain Jackson took two troopers North West to approach the Landing Pad's ramp, a single Soldier went directly towards the Land Pad's Southern Edge and the remaining Soldiers accompanied Lieutenant Sally to the North East, approaching the IKUBEs and objectives on the Eastern side of the map. The Imperial Patrol was spread over the port, and Captain Durailus, a Solider and his Heavy Weapon Specialist approached from the North in response to an sensor being tripped. He called in the rest of his Team to back him up, but couldn't be sure they'd be with him in time. Things didn't go well for the Rebels initially: both Lt Sally and her Soldier failed their initial attempts to access the closest IKUBE, and the soldier trying to scale the wall of the Landing Pad also failed - the two nearest Objectives were so close but so far away. The first early game highlight involved one of the Imperial Reserves: Ensign Revell. The Ensign's knowledge of the area proved invaluable as he caught Captain Jackson's fire-team by surprise: appearing directly behind the Rebels, Revell fired a Close Range, sending Jackson howling into retreat. Fortunately for the Rebel forces, Jackson's two soldiers kept their wits and return a hail of photon bolts back at Revell, who quickly saw he was outgunned and turned tail himself! One brave Imperial Marine charged down the main street in a gallent attempt to take out Lt. Sally, only to have her gun jam! Fortunately, despite the Rebel's attempt to take out the exposed Marine, she was covered by the Imperial Minigunner who sent two Rebels Reeling for their trouble. There was even some back-alley knife fighting: Durailus sprinted up to a Rebel trying to access the North Eastern IKUBE and only just managed to overcome him in hand-to-hand combat. That was a turning point, as should that Rebel accessed the building, then the Rebels would have likely hit their Objective Point goal by Turn 5. As it turned out Jessie, the Rebel's Heavy Weapon Specialist, was the hero of the day: after setting down outside of the South Eastern Objective, he managed to consistently lay down the necessary fire to keep the Imperials at bay whilst buying time for his team mates to hack into the communication network, both via the IKUBE and Landing Pad. Despite taking heavy losses, the Rebels held on, racking up their 6th Objective Point by the 6th Turn, only for the Imperial Shock Troopers to arrive and capture them before the network could be disabled. What tension!! What drama!! What a great game! !